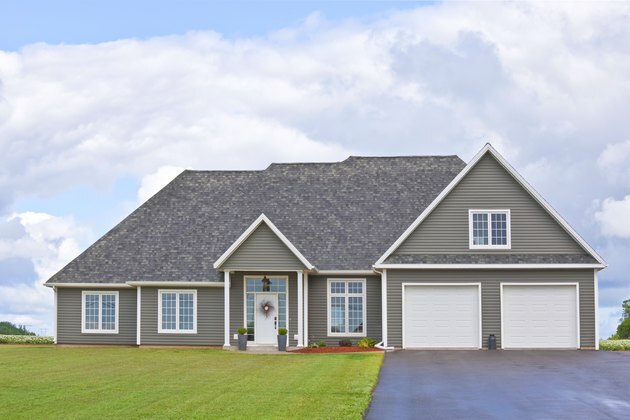 The roof plays a major role in creating curb appeal because it can be up to 30 percent of what you see as you approach a home. Blend the color of your roofing material with other elements of the house exterior to create an overall cohesive look. The architecture provides a strong hint of amenable color choices. Your neighborhood color schemes are another source of inspiration. The varied tones of a multicolored roof may suggest a variety of possible matches. Roof and siding colors blend in well for a uniform look, the roof a bit darker than the siding. The lacy Victorian "painted lady" might have variegated burgundy and charcoal roof shingles but be tarted up in a purple, turquoise and sunflower-yellow paint job with the merest trace of red trim. The classic adobe with clay roof tiles will almost always have earth-colored exterior walls, the colors of the high desert. Your slate roof country estate will look suitably in-character with pale putty walls. The thatch-roofed cottage might as well be lime-washed. The type of house you have can dictate the roofing materials as well as the colors of the exterior. In most cases, the two should coordinate, but more brazen styles often have their own rules. When you do decide to pull a color from the roof to inspire the walls, get some perspective. Your multicolored shingles might gleam in reds, purples, blues, grays and greens up close, but that fine detail is invisible from the street. Stand at the outskirts of your property to check what color the roof appears to approaching guests and passersby. Your stucco palace has a sun-splashed terra-cotta roof, all flat and barrel tiles, very visible from the road for maximum curb appeal. Unadulterated terra cotta is clearly a warm roof treatment that harmonizes well with warmer, lighter siding colors. Pale gold, antique white, soft peach and rich amber will set off the roof to advantage. But there are times when a cool exterior wall paint is a smart choice to match a bold environmental statement. Solar panels set into or on the tile roof are usually cool-colored industrial materials -- glass, plastics and metals -- and the house paint can mirror those dominant panels punctuating the roof. Pale concrete-gray, a ghostly white with a hint of gray, or washed-out putty are soft enough for the earthy tile and neutral enough for the intrusive hardware. Follow some general color guidelines when coordinating roof and house colors. Black, dark gray or brown shingles work with a red clapboard country home and can top red brick attractively. Red brick is sharp with a black or a vivid or dark blue roof and white trim. Gray, brown or black roofs look good with green siding; light olive house paint is attractive with those darker shingle colors. Yellow or gold house paint is a chameleon that flatters tile-red, green, blue, gray brown or black roofs. A gray roof is an invitation to monochrome. Lighter or darker house paint and a contrasting intensity of gray trim create an elegant all-gray exterior for any style home. Brown or warm medium-gray shingles are low-key and upscale with cream or tan house paint. A white roof is a challenge, but it does reflect heat back nicely, keeping the house cool and the energy bill low. For that reason, you most often see white roofs in sub-tropical and tropical climates. Wherever your white roof happens to be located, you can tame its eye-popping brightness with your color palette. A white metal roof looks shipshape with cedar shingles or slate-blue siding. Charcoal shingle siding, white trim and stone chimney and porch balance a white metal roof in a temperate climate. White concrete "barrel tile" roofs are classic with white, cream or pastel paint over exterior stucco -- apricot, mint, ice-blue or pale honey look rich on the walls. And you can always choose white-on-white -- a white metal or concrete roof with the same tone of white exterior paint. Lush landscaping around the house makes the difference with unrelieved white. What Colors Go With a Green Metal Roof?